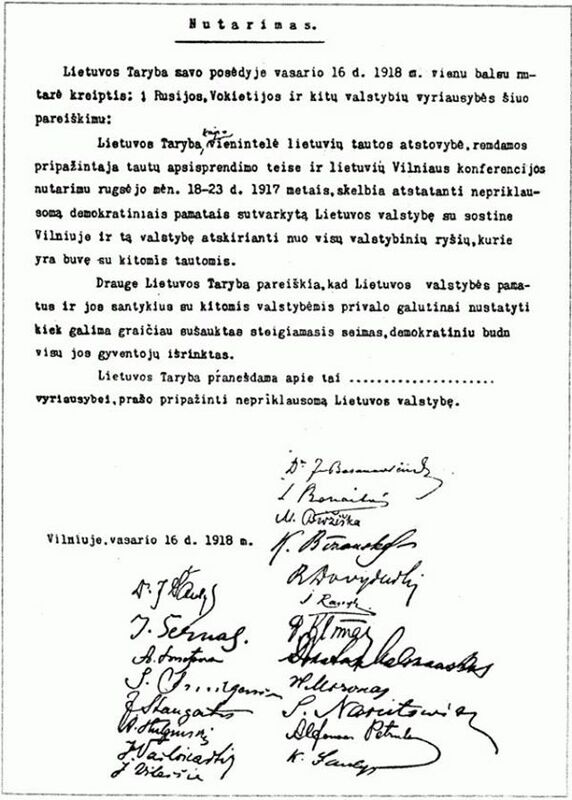 The Act of Reinstating Independence of Lithuania (Lithuanian: Lietuvos Valstybės atkūrimo aktas) or Act of February 16 was signed by the Council of Lithuania on February 16, 1918, proclaiming the restoration of an independent State of Lithuania, governed by democratic principles. The Act was signed by all twenty representatives of the Council, which was chaired by Jonas Basanavičius. After the last Partition of the Polish-Lithuanian Commonwealth in 1795 between Russia, Prussia and Austria, Grand Duchy of Lithuania became a part of the Russian Empire. During the 19th century, peoples of the Commonwealth, Lithuanians, Poles and Belarusians, attempted to restore their independence. There were two major uprisings during the 19th c.: in 1830 and in the 1863, but, unfortunately to the rebels, they were unsuccessful. The real opportunity to regain independence arose when both Russia and Germany were weakened during World War I. In 1915, German army entered western parts of the Russian Empire. After two Russian Revolutions in 1917, Germany conceived the geopolitical strategy of Mitteleuropa – a regional network of puppet states that would serve as a buffer zone. Guided by this strategy, the Germans agreed to allow the Vilnius Conference, wanting Lithuanians to proclaim that the Lithuanian nation wanted to detach itself from Russia and establish a union with the Germany. However, this strategy was not executed as German authorities wanted. The conference, held in September of 1917, adopted a resolution that an independent Lithuania should be established and that a closer relationship with Germany would be conditional on Germany’s formal recognition of the new state. On September 21, the participants of the conference elected a 20-member Council of Lithuania to implement this resolution. The German authorities did not allow that resolution to be published, but, on the other hand, they permit the Council to proceed. The immediate effects of the announcement of Lithuania’s re-establishment of independence were limited. A publication of the Act was prohibited by the Germans. The text was distributed and printed illegally. The Council worked with great difficulty, as the German army remained in control over Lithuania. The situation changed only when the World War I was finished in the fall of 1918. 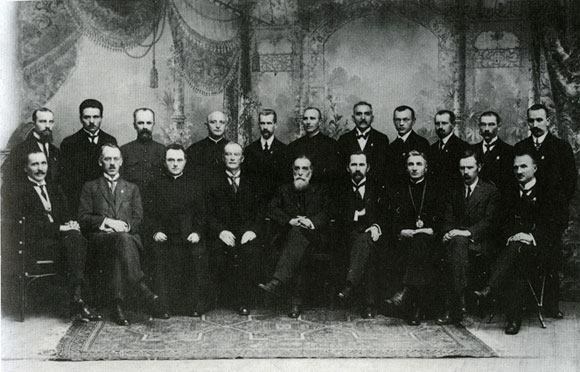 In November this year the first Cabinet of Lithuania was formed, and the Council of Lithuania gained control over the part of the territory of Lithuania. Independent Republic of Lithuania, it would soon be battling the Wars of Independence, became a reality. While the Act’s original document has been lost, its legacy continues. The most important point is that the laconic Act of February 16 was and is now the legal basis for the existence of modern Lithuania, both during the interwar period and since 1990. The Act formulated the basic constitutional principles that were and still are followed by all Constitutions of Lithuania. The Act itself was a key diplomatic element in the Lithuania’s re-establishment of independence in 1990. 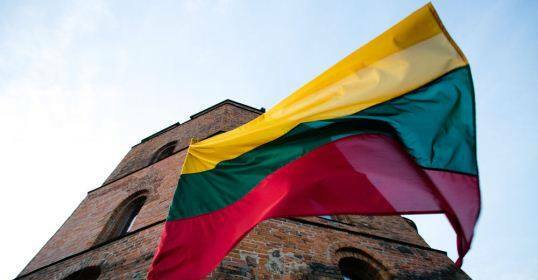 Lithuania, breaking away from the Soviet Union, stressed that it was merely re-establishing the independent state that existed between the world wars and that the Act never lost its legal power. 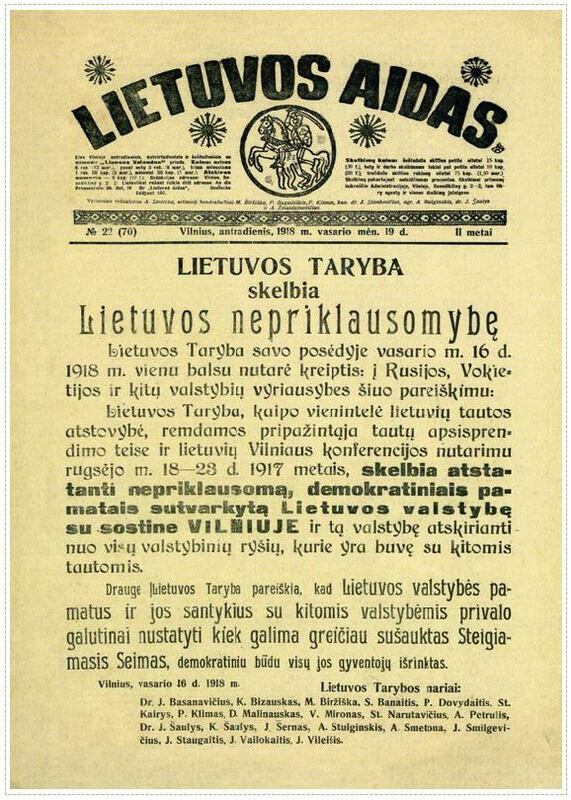 Nowadays February 16 in Lithuania is now an official holiday.